Capturing topographic data on the job site can take up valuable time and money. Fortunately now you can take to the skies with the Kespry aerial intelligence system sold and supported by John Deere dealers. 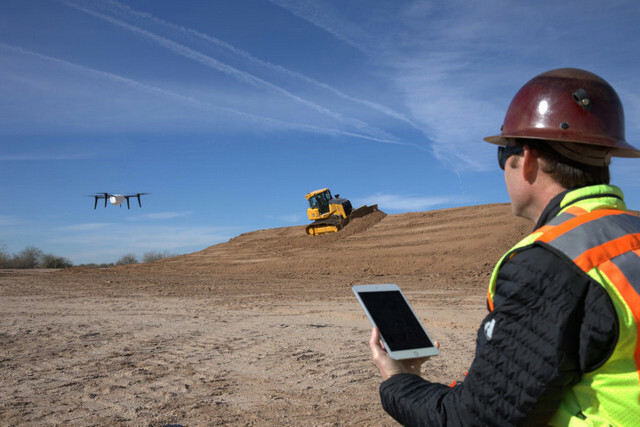 The Kespry Drone captures survey grade topographic data for site development and road building projects, plus quarry aggregate and mining operations. In addition to, the major players of the agricultural drone industry just planted a new business with this foremost farm equipment giants. Drone software and hardware companies Sentera and Agribotix inked a deal to integrate its Unmanned Aerial Systems (UAS) platform with John Deere. The company will deploy its FarmLens NDVI Software to empower John Deere dealers to offer customers enhanced precision-ag tools – a move that will allow farmers to optimize crop yield and make more cost-effective. FarmLens will help John Deere dealers access all data from field-specific analytic reports that integrate with the customers' John Deere Operations Center account. Using the platform, John Deere dealers will be able to send insights to customers' production practices to assist with data-enabled decision making. With Kespry you can easily generate aerial imagery topographic maps 2d and 3d models and accurate volumetric data, safer, faster and more frequently for the entire site. Kespry collects topographic data in minutes on sites that would typically take hours or days using traditional survey equipment. The Kespry Drone 2s makes capturing field data quick and easy, create a mission with a touch of a finger, then capture analyze and share data and insights. The Kespry Drone 2s calculates the flight path and flies autonomously using LiDAR sensors to avoid obstacles such as trees, cranes and buildings. The Kespry system manages the transfer and processing of data with in the platform, no SD cards or clumsy integrations to manage. Kespry cloud is the aerial intelligence platform where flight data is securely stored. A suite of 2d and 3d earthwork tools are used for planning, fitting and management of earthwork operations. customized reports for cut and fill quantities and stockpile inventories are automatically generated and all data can be exported to industry standard file format. above all you'll receive personalized support from a John Deere dealer technology specialist. the sky's the limit with the Kespry aerial intelligence. What’s the easiest way to capture survey-grade topographic data? The Kespry Unmanned Aerial Intelligence System, sold and supported by John Deere dealers, lets customers easily conduct site surveys and visualize job progress. This complete system provides accurate data for earthwork planning, progress tracking, or for volumetric understanding, meaning how much is growing in, or coming out, of a given tract of forest. One of the ways drones can help construction workers and farmers is by flying over their sites while taking pictures. These pictures can help them to keep tabs on their productivity, track their materials, and monitor how their projects come together. 0 Response to "John Deere Partners with Kespry Drones to Capturing Topographic Data on the Job Site"